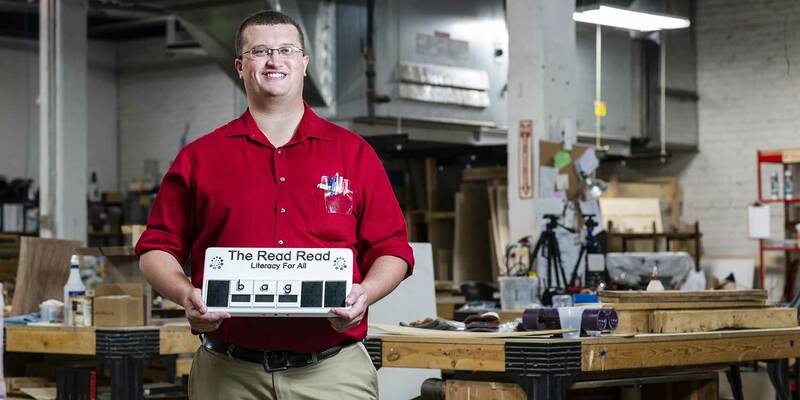 Alex Tavares, a literacy instructor based in Ohio, with his Read Read device for vision-impaired students. Lesson plans. Books. Lists of sight words. These are some of the things teachers commonly use when they help others learn how to read. As a literacy instructor, Alex Tavares, Ed.M. '17, had used them, too. But then one day Tavares found himself in an unlikely place — his parent’s garage in Rhode Island — with a completely different set of tools he wasn’t entirely used to but planned on using: a handsaw, a screwdriver, and a how-to guide on basic electronics. He would become better, a lot better, the more time he spent in the garage, as he continued building a prototype started earlier at his own place in Ohio, made of wood and metal, for an innovative idea he had to help struggling readers, especially those who were blind or vision impaired. It would eventually be called the Read Read, and it would put Tavares in a category few teachers imagine but one that is becoming more and more important in the education field: entrepreneur. Eventually he started tutoring illiterate adults and saw what happens when reading problems go unchecked longterm. Tavares was proud of the tutoring work he was doing, especially when he started getting referrals from happy parents. There was a problem, though — the problem that would lead him to the Read Read and the garage. In between lessons, students would forget what they had learned and sometimes even get worse. After coming up empty-handed, Tavares decided to do what a rising number of frustrated educators are doing: He created his own practical solution to a problem rather than make do with what already exists. David Rose, Ed.D.’76, creator of the Universal Design for Learning framework and one of Tavares’ professors, says this is what makes educators as entrepreneurs unique. The Read Read is basically a big board with white tiles that look like oversized dominos. Each tile has a large embossed letter (“L”) or phonetic sound (“ing”) printed in black, plus corresponding braille — the tactile reading and writing code of raised dots invented by Louis Braille in the 1820s. On a conductive magnetic bar at the bottom of the board, students arrange the tiles to spell out words, or they can just use one letter at a time. The device senses when you’re touching the braille dots and says the letter’s name (“r”) or its sound (“ra”), depending on the mode that’s set. If a student puts a few tiles together and swipes across the dots, the full word is sounded out (“ra ah t” for rat). Students can use the device to learn to read, to learn braille, or for those who already know braille, they can practice spelling. The latest version of the Read Read device. Tavares says the key to the Read Read is that it allows for independent learning, mimicking what a student would hear working one-on-one with a teacher or literacy specialist. This independence is important for any learning reader, but especially, he realized, for those with vision impairments. “As a tutor, I had some students who were braille readers. Although I’m trying to help the whole world to read, I realized the biggest crisis in literacy is blind students.” Since Congress passed the Rehabilitation Act of 1973, thousands of visually impaired children were moved from specialized schools for the blind into mainstream public schools; today, it hovers at about 80 to 90 percent. Tavares says that while assimilation can be amazing, it has also posed huge problems for blind students when it comes to getting the reading help they need. “Specialist teachers travel from school to school, district to district, to help students. This small number of teachers means students can receive services as little as once a week or even once every two weeks,” he says. “It’s a complex issue, some having to do with fewer young people going through these programs to teach. There just aren’t enough teachers to meet the need.” The national Association for Education and Rehabilitation of the Blind and Visually Impaired, for example, reports about 1,000 fewer members nationwide than 10 years ago. Plus, Tavares says, “even if a teacher is trained to teach braille, they’re not trained in phonics,” that critical relationship between letters and sounds in a language. The result is that most blind students today can’t read or write. Of the 62,000 legally blind school-age children in the United States, only about 8 percent are able to read braille, according to the National Federation of the Blind — a huge drop from just 50 years ago, when at least half of legally blind students were literate in braille. Knowing this, Tavares pushed himself to complete his prototype. The question became, what next? having an idea wasn’t enough. He was a teacher. He had figured out basic carpentry and electronics, but he didn’t have a business or marketing degree or an “in” with an investor. He didn’t know the first thing about turning an idea this big into reality. So he decided to go back to school. He applied to the Ed School, where he hoped to study under Rose and his udl team and, in turn, learn how to move the prototype out of the garage and into the world. “In my mind, I thought that I would form a nonprofit, go to philanthropists with my idea, and they would shower me with money — an approach that may work for some more charming alums!” he jokes. But once Tavares got to Harvard, that plan changed almost instantly. During his first week on campus, at a career fair, Tavares met Matt Guidarelli, then associate director of social impact at the Harvard innovation lab (i-lab). Throughout the fall semester, Tavares dropped by the i-lab and updated Guidarelli on his progress. In the spring, he was accepted into the i-lab’s Venture Incubation Program, where he recreated his wood and metal model as a 3-D print prototype. During both semesters, he tailored every class he took (except Statistics) toward the Read Read. In an entrepreneurship class with Professor Fernando Reimers, Ed.M.’84, Ed.D.’88, for example, he worked on a marketing plan. In Professor Chris Dede’s class, he wrote a research paper on tactile literacy. With Senior Lecturer Joe Blatt, Ed.M.’77, director of the Technology, Innovation, and Education Program, he studied informal learning. With Professor Rose, he made sure the device was in line with UDL principles. And for a practicum with Rose, he conducted a 12-week pilot at the Perkins School for the Blind in nearby Watertown, Massachusetts. It was at Perkins where he got to see how actual users responded to the device. 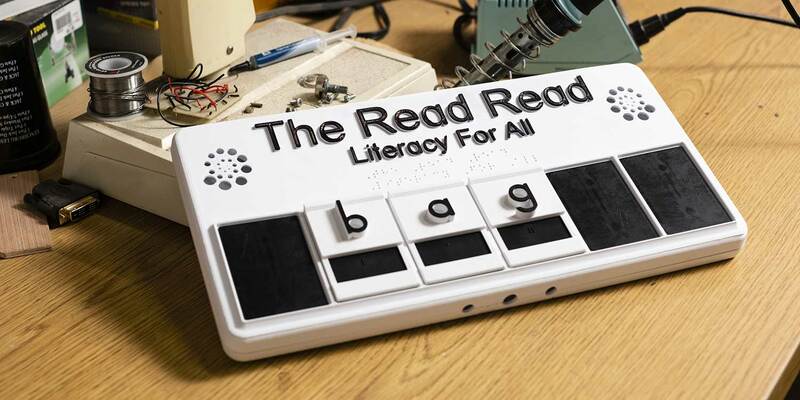 Kate Crohan, a braille and technology teacher at the school, says the students, ages 13 to 22, loved the Read Read, even those who are normally reluctant readers and writers. Based on student and teacher feedback, which he is still getting today as the Read Read continues to be used at Perkins, Tavares refined his prototype. “Have you ever dropped a little knickknack somewhere that makes it hard to retrieve by hand? When this happens, you search for a tool to retrieve it: a coat hanger, tweezers, a magnet,” he says. “While rummaging through a drawer, the moment you spot the right tool, you have a sense of relief. You haven’t yet retrieved your knickknack, but you’re almost certain that you soon will. That sense of relief is what I felt when I conceived of the Read Read. In an instant I envisioned it and felt elation. I had the background knowledge and experience to know that it would most likely work, but to ensure that my solution was a good one, I had to test it. In order to do that, I had to build a prototype, no matter how crude. Of course, tweaks would be necessary, but they would be just that.” Initial tweaks included changing the braille size and placement, as well as the degree of magnetism in the tiles after a child with impaired motor control was having difficulty orienting them on the board. “This fixed the problem for him and made the device better for everyone” — a concept Tavares has been intentional about, wanting the Read Read to be useful for anyone learning how to read. The 3D printing options at the i-lab also made tweaks easier and faster. “I would pilot at Perkins on Tuesday, record design changes, redesign, and begin printing Tuesday night, post-process, and reassemble the parts on Wednesday, make changes to electronics and software Wednesday night, then pilot again Thursday morning,” he says. “I would then prepare a modified design for the next Tuesday. This intense five-month iteration cycle would have been logistically impossible, or cost-prohibitive, until very recently.” Tavares estimates that his first prototype took about 110–200 hours of hands-on time to build. For Tavares, start-up costs were high and funding remains the biggest obstacle to getting the Read Read into more hands. But it’s not what he has in mind for the Read Read. First he tried a Kickstarter campaign last May, hoping to raise the estimated $270,000 he thought he needed to begin production. The Kickstarter didn’t get funded, and he’s reconsidering another one at a lower target amount now that he doesn’t have to factor in the high cost of engineering design. He’s also in conversation with LC Industries, a contract manufacturer that does injection molding and who employs visually impaired and blind adults. He’s exploring grants and funding through programs like Small Business Innovation Research and the National Science Foundation. He’s also offering exclusive distributorship options for organizations outside of the United States in exchange for startup funding — a model he says worked successfully for another recently launched technology for the blind. For now, he is back living in Ohio, no longer sleeping in his childhood home in Rhode Island, and getting more than just a few hours of sleep. Traits that were handed down, perhaps, from his family. His grandfather came from Cape Verde with only a fifth grade education and earned enough as a cook on a tugboat for Exxon Mobile to support his family. Tavares’ father was a police captain; his mother and both siblings went into education. These days, Tavares is confident in the Read Read and believes — as any good education entrepreneur must — that others will continue to be, too. He has started to take preorders: Once he reaches 500, he can start full-scale manufacturing with LC. “From a practical standpoint that applies to the general investor mindset, I have significantly de-risked my business,” he says. “I have created a product that meets the needs of a population, tested the product with members of that population and demonstrated its efficacy, ensured that potential buyers are interested and able to purchase the product at a price that allows me to scale to help more children over time, and I have relied on mentors and case studies along the way to avoid major pitfalls.” Now he just needs to stay hopeful. Watch a video interview about the Read Read.